For convenience, we'll refer to auto focus, self-focusing, constant-focus, and permanently focused binoculars all as "auto focus binoculars." 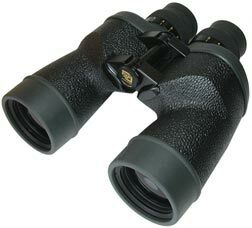 These binoculars are permanently focused by the manufacturer for medium distances (usually around 30 to 60 feet) to infinity. This means that the binocular is focused for a clear view of objects at or beyond 30 to 60 feet whenever you bring it to your eyes. Many particularly appreciate this type of feature when using binoculars for watching stadium and racing events. If you'll be using your auto focus binocular mainly at these sorts of events or other situations where you're not looking through them for extended periods of time, you'll doubtless be pleased with them. There are two types of auto focus designs you will want to be aware of if you're considering this design. The first has no provision for adjusting either of the binocular's barrels. The second may be mistaken for an individual focus design in that it provides for the binocular barrels to be focused separately. If you don't intend to use the instrument much, the first design may work for you. The second design is much more pleasant to use and will provide a significantly better view. If you expect to use your binocular more or less constantly throughout a game or race or for extended periods, you'll want a model that allows the focus to be customized for your eyes. Sore eyes and headaches are neither fun nor necessary and adjusting the focus for your own eyes will prevent them. If your heart is set on an auto focus instrument, we recommend that you find one that allows for adjustment for both eyes. There are Fujinon auto focus models with individually adjusted eyepieces, for example. If you choose an auto focus binocular with provision to adjust for one or both eyes, look below at the section about how to focus individual focus binoculars. That will give you the best approach to use in adjusting your instrument to your own eyesight. Using binoculars in a group can teach you a lot about others' viewing habits. When using binoculars for extended periods, as when watching wildlife from a blind/hide or during surveillance, you may have heard others complaining of sore eyes and/ or headaches. We have found that such complaints usually meant the instrument had not been adjusted for the small, but important, differences in strength between the user's eyes. Our brain and eyes are able to compensate for small differences between the eyes for a while, but will rebel in their own way if asked to do it over a longer term. Usually, that means sore eyes and/or a headache. 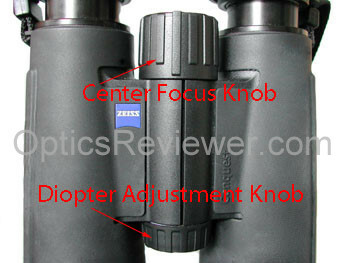 Here our attention is on adjusting a center-focus (CF) binocular for your eyes. Following this section, we'll address the best way to focus an "individual focus" binocular to avoid eyestrain. You'll note the similarity to auto focus binoculars in that it's important to customize the focus for your own eyesight. Adjust the focus until the binocular is to its extreme distant focus and look at a distant object with your right eye closed. Slowly bring the focus back until the object being viewed is in sharp focus. If you over adjust the focus, go ahead and push it all the way back out to the extreme again and slowly bring it back until the image is sharply defined. Once you achieve that, don't touch the center-focus knob again until the following step is complete. Now that you have the instrument focused for the left eye, we'll go to the diopter adjustment to make the necessary changes for your right eye. Usually, this is a ring just forward of the right eyepiece, but it can be on the left eyepiece or a separate knob that you may have to gently pull out from the center-focus knob. Turn the focus for the right eyepiece all the way out and then, keeping your left eye closed, look through the right eyepiece. Slowly turn the right eyepiece adjustment until you achieve a sharp focus for the right eye. If there is a means of "locking" the adjustment for the right eye, do that. 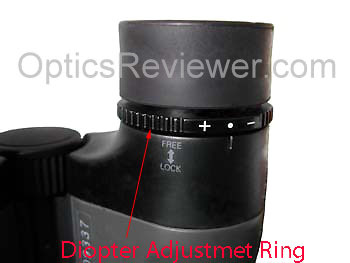 Locking a diopter ring by the eyepiece usually means pushing it away from the eyepiece. Locking a center-focus diopter adjustment usually means pushing it back in. When first using your own CF binocular then, it's important to adjust its focus to your own eyes. After that, adjust them if you notice your vision has changed or at least annually. An IF binocular's focus is quite similar to that of a good quality auto focus binocular that is capable of adjusting for one or both eyes. When you put it up to your eye, start turning that eyepiece "in" until the focus is sharp. You don't want to go past that point and then come back to it, but if you do just turn the eyepiece back out and start over again. Don't try to focus by rocking it back and forth to "center" on a sharp focus. When we "center" on a sharp focus, our eyes will accommodate a slight mis-focus which will strain the eyes if they're used that way for long. Adjust both eyepieces in this manner - one eye at a time if necessary (most of us concentrate on one eye at a time, at least to start with!) - and you'll have a perfectly focused binocular that's ready to use. Extensive tests by the military which compared the two approaches to adjusting individual-focus binoculars have shown that rocking back and forth to center on a focus will result in errors of a half diopter and more. It may be counterintuitive, but it's scientifically tested!